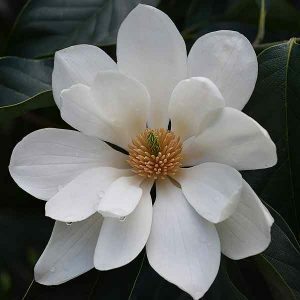 The evergreen tree we used to call Michelia doltsopa is now named Magnolia doltsopa, however still sold under the old name in many nurseries. One of the better flowering trees, it is fast growing, easy to prune and offered in a number of varieties by wholesale growers. It is the smaller growing cultivars such as the popular ‘Silver Cloud’ that are popular with landscapers. This variety is earlier flowering than the species, good clean white flowers that appear over a number of months from mid winter through to summer. Used widely as fast growing evergreen hedging plan, Michelia doltsopa ‘Silver Cloud’ is a popular cultivar as it will flower at a much younger age than the species and has a generally better form and flowers. Large white flowers are a feature, well suited as a tall screen. A tall growing relative of the magnolia Michelia doltsopa are used as a tall screen or as a specimen tree that wil reach a height of 8 – 10m depending on conditions. Covered in masses of perfumed white flowers from spring to summer. Well drained humus rich soil. Will need extra water through the first few summers.